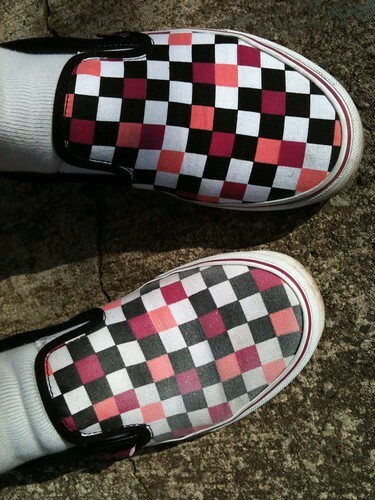 My new Vans are not faring too well. I managed to sink into some very muddy grass while walking the pooches the other day, but only 1 of my new kicks got dirty. As soon as I got home I scrubbed the mud off & was breathing a sigh of relief as I laid it out to dry in the sun. Wet? It looked fine. I had no idea that once it dried the colors would be so faded! For future reference – if you have to wash one of your shoes, wash the other one too. And maybe buy that protective spray stuff the sales folks are always trying to upsell you.